'Suspicious Minds' was Elvis' greatest single of the 1960s and opinion polls often vote it as the greatest song Elvis ever recorded. 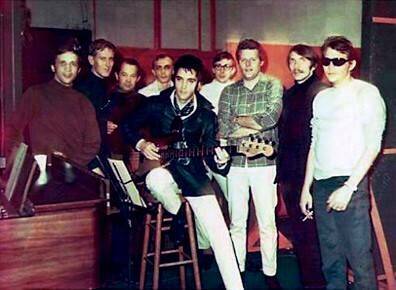 It was the final evening of his first recording session of 1969 and Elvis was enthused when he had the chance to meet one of his musical heroes Roy Hamilton who was working at the same studio. With renewed excitement Elvis threw himself into the final evening’s work showing an incredible intensity firstly on ‘Without Love’ and then the impromptu ‘I’ll Hold You In My Heart’. The final over-dubbed single would be released on August 26th 1969, only two days before the end of Elvis’ record-breaking Las Vegas season. To celebrate the 40th anniversary EIN's Piers Beagley looked back in detail at the history of this classic song. 'Suspicious Minds' was Elvis' greatest single of the 1960s and opinion polls often vote it as the greatest song Elvis ever recorded. 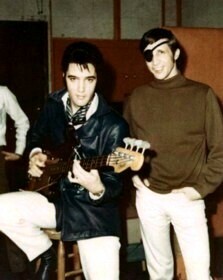 It was the final evening of his first recording session of 1969 and Elvis was enthused when he had the chance to meet one of his musical heroes Roy Hamilton who was working at the same studio. With renewed excitement Elvis threw himself into the final evening’s work showing an incredible intensity firstly on ‘Without Love’ and then the impromptu ‘I’ll Hold You In My Heart’. It wouldn’t be until the final early-morning hours of January 23rd and the last song of the 10 day session that Elvis would complete ‘Suspicious Minds’. The final over-dubbed single would be released on August 26th 1969, only two days before the end of Elvis’ record-breaking Las Vegas season. 'Suspicious Minds' was composed by resident songwriter Mark James who had recorded and released a version of his own on Scepter Records the previous year. His original version was also recorded in American Studios with the same house-band and produced by Chips Moman. 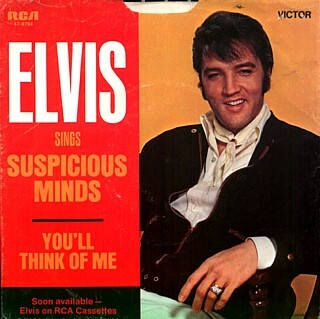 While James would also go on to write the other Elvis hits 'Always On My Mind', 'Raised On Rock', ‘It’s Only Love’ and 'Moody Blue' there was a special magic about ‘Suspicious Minds’. Mark James explains, "I lived and breathed working at American Studios. I wrote songs night and day. I was really driven to get songs on the radio. When I went home at night, most of the time I'd only sleep a few hours because I had another session in the morning or because I was writing most of the night hoping to go back in the studio, the next day with a good song to record. I had the idea for ‘Suspicious Minds’ and it started coming to me one night. First the title came and I thought about it and lived with it a while. Then the lyric came to me, "caught in a trap, I can't walk out because I love YOU too much, baby." What I was trying to say is that we can't live together or attain our dreams or build on anything if we don't trust one another. ‘Suspicious Minds’ captured a lot of soul. I was a writer trying to write a great song, a hit song and it came off just right". The 1969 pop charts were one of the strongest in years with the political, 'Bad Moon Rising' by Creedence Clearwater Revival, 'Something in the Air' by Thunderclap Newman mixing with the innovative, David Bowie's 'Space Oddity' and the classics, The Rolling Stones 'Honky Tonk Women' and The Beatles 'Come Together'. ‘Suspicious Minds’ was a serious pop song about deep love, suspicion and hurt and with a dramatic operatic power. Elvis’ musical strength had always been as a great interpretive singer and it would only be the absolute passion he injected into the song that would elevate it to the #1 slot amongst these other classics. After recording the politically contemporary and inspirational 'If I Can Dream’ Elvis had vowed to 68 TV Special producer Steve Binder that he would never sing another song he didn't believe in. ‘In the Ghetto’ the first single taken from the American Studio Memphis sessions had confirmed Elvis’ musical reawakening but had only reached # 3 on the all-important US Billboard charts. Memphis Horns trumpet player Wayne Jackson explains, "American Studios was in the worst part of town. Stax was a little nearer Graceland, but American and also Hi Studios were in the worst parts of town. After the recent assassination of Martin Luther King it was tense, especially in the parts of Memphis that were mainly black. I remember that the studio was guarded by dogs, and there was a man on the roof with a gun minding the parking lot." 'Suspicious Minds' starts with *Reggie Young’s nagging, repeating guitar-riff matched to Bobby Wood’s piano line which helps sets the listener on edge. However when Elvis comes in with the extraordinary first line for a pop love-song "We're caught in a trap" the drama is immediately revealed. Throughout the whole song there is a real flow of emotion with Elvis' vocal sounding both vulnerable and desperate as he pleads to his girlfriend that he loves her too much. 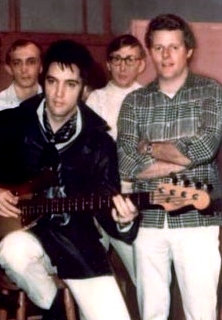 Bobby Wood (right with Elvis) explains, "As a band we always came up with our own arrangements. On 'Suspicious Minds' we basically copied what we had played on the Mark James original. I remember that we worked as we always did and we had a lot of fun recording with Elvis. I found out later that Elvis loved those sessions and worked harder than he had in years. I think he respected our talents as well as we did his. We worked a lot differently at American from what Elvis was used to. It usually took Chips and the other engineers a good long while to get "a sound." That was rough on the singers. They'd have to stand there and sing the same song over and over for an hour, before we'd even record a take. In fact on the third night Elvis lost his voice with bad laryngitis. We most always recorded horns, strings and backgrounds as an overdub. I think Joe Tex was the only one that wanted horns on the original session. At the time we didn't even think that this was part of Elvis' musical renaissance or anything. We were trying our best to record a hit, be it Elvis or Joe Tex or nobody. Though we pretty much knew it was a hit record when we recorded it." While Elvis’ regular producer Felton Jarvis was also involved, it was American’s producer Chips Moman who controlled the session and it is his voice you can hear on the session recordings as he drives Elvis and the band for better and better takes. Marty Lacker explains, "During the sessions I spent most of my time in the control room with Chips. Elvis came in and said to Chips that he didn't know what to do because he didn't have any good songs left to record, describing the crap that Parker and Freddy Bienstock had sent him. That was the point when Chips suggested ‘Suspicious Minds’ and that he thought it would be great for Elvis. He was also up front in telling Elvis that he had cut it already on Mark James but that it didn't do anything on the charts." 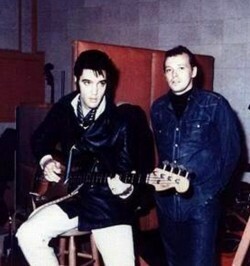 Chips Moman, (right with Elvis) "Elvis had a good ear for music, and if he didn't think he could do a song he'd toss it out. However when it came time to do the American sessions there was a lot of them old Hill and Range songs that some of the people around him wanted him to cut real bad, and they kept pushing for them. I don't even want to tell you what I thought of some of those songs! Truth is, the trouble wasn't really with Elvis but with some of those publishers." RCA’s director Joan Deary commented on Chips Moman’s impact, "When I first heard the tapes from the American sessions I called Chet Atkins and asked, "Who did Elvis' recording of `In the Ghetto'?" Right off the bat he said, "Chips Moman". 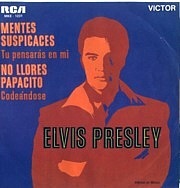 I thought the sound was so superior to what I had been hearing from Elvis in the past that I couldn't believe my ears! There's such a big difference between this and his old stuff. That whole Memphis recording collection was incredible, and yet Elvis never went back and recorded with Chips again. I'm not sure why. Maybe it was the influence of Hill and Range, which had always had a big piece of the publishing on other Presley records. They certainly lost their total control when Chips entered the picture." The impact that Chips Moman had cannot be understated. This creative and musically innovative setting obviously invigorated Elvis and throughout the eight takes you can hear him striving for that consummate perfection as he pours his soul into every word. By Take 6 Elvis is still faltering over the timing yet asks for Chips to "Save the last take for me." Elvis recognised the greatness of the song and worked at it for 3 hours until it was time for everyone to head home into the dawn. Interestingly for collectors the 1987 RCA release ‘The Memphis Record’ features the final 'Suspicious Minds' Master with the backing-vocal & strings overdubs but without the added brass section nor with the extended fade-out. Unusually for an Elvis release, Chips Moman also recorded a dual-track for Elvis’ lead vocal thus increasing the emotional power of the lyric. A portion of Elvis singing along, while listening to his other vocal on headphones, can be heard on the ‘Elv1s 30 #1s’ DVD audio release. All 8 takes and rehearsals can be heard on various bootlegs. 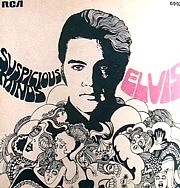 When Elvis returned to Vegas on July 31st 1969 for his stunning live season he had decided to use 'Suspicious Minds' as the key song of the concert. Often extending the song to over 7 minutes, he included a fade and return for dramatic effect. The rave reviews were a testimony to Elvis’ newly found excitement in rediscovering a loving audience who believed in the power of his performances. While the delight of the Elvis classic oldies and the contemporariness of ‘In The Ghetto’ are mentioned in reviews, the newness of 'Suspicious Minds' appears to be a bit of a mystery as the song hadn’t even been released. 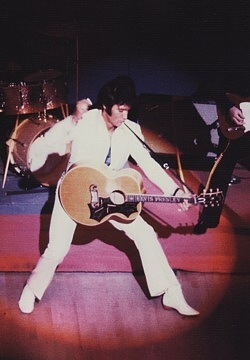 Reviewer Bill Crawford noted, "With his left leg moving like a jack hammer, Elvis runs the gamut of his old favourites. His newest song ‘Suspicious Mind’ is a sensuous medium rock ballad that is sure to sell." The fact that Elvis chose a totally unknown song as the centrepiece to his concerts is astounding and demonstrates his belief in the song. Felton Jarvis witnessed Elvis amazing performances and realised that the original Master would be even more remarkable if he could only replicate Elvis’ dramatic fade & return ending for the single release. On August 7th Felton Jarvis, along with engineer Bill Porter, took the master tape into United Recording Studio, Las Vegas to create the unique fade and return ending. In the late sixties mono A.M. radio was still the main source of pop music and so two separate mono and stereo masters were recorded. The idea of a mono master was to create a greater impact so that it would jump out with more power from car radios. Both version featured different brass overdubs and it is interesting to note that the recently released ‘From Elvis In Memphis’ Legacy edition includes the all-important mono master of ‘Suspicious Minds’. It was at this Las Vegas session that Felton Jarvis also did the final stereo and mono mixes. The final single runs 4:29 minutes with the fade-out from 3:19 - 3:34 & fade-in 3:34 - 3:47. While the false ending not only replicated Elvis’ sensational on stage version, the fade & repeat also cleverly created the feeling that the singer is indeed "Caught in a trap" within the actual song. This idea was yet another unique stamp that would be forever memorable to anyone that heard the song. If a radio station fades the song out early it just sounds wrong. At the time however not only was the false-ending not the record that Chips Moman had produced but was also a guaranteed trap for radio jocks to fall in to. This had a potential to reduce the all-important radio plays. 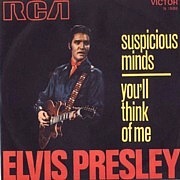 At a full four and a half minutes, the final version of 'Suspicious Minds' was also nearly twice as long many of Elvis previous top ten hits. Marty Lacker describes how he was shocked by the final version..
"I don't know if Elvis was even aware before Felton did the extended ending but I can tell you that as far as the disc jockeys and radio program directors were concerned they almost didn't play the record because of it. It had the potential to screw their timing up on the shows plus it messed with the listeners’ ears. The next year Chips Moman was given the Producer Of The Year award from the prestigious Gavin report publication. Chips won that award not just for Elvis' records but also for all the other hits he produced. Bill Gavin was a highly respected radio and records publisher who was subscribed to each month by every radio station and record company in the US. Chips the band and I attended the awards convention in Atlanta. Bill Gavin even asked Chips why in the world he put that fake ending on the song. The reason being because many D.Js and producers had told Gavin that at first they wouldn’t play the record because of it - and others told him they just cut the record off before the fade and bump. I still feel that the fade & bump ending is good for on stage but not on a record and that it was a stupid, amateurish move by Felton". Incredibly 'Suspicious Minds' nearly wasn't released at all. This was because of Col Parker’s and Hill & Range’s desire to always get a cut of the publishing. Chips Moman owned the rights to 'Suspicious Minds' and he certainly wasn’t going to part with any of it. In the end it was a triumph of both Chips Moman and Elvis that they both stood their ground. At one point Moman even suggested that Parker’s representatives could take their money and "get the hell out". Parker's assistant Tom Diskin still persisted and complained to Elvis personally. Elvis told Diskin, "I know you’re just doing your job, but leave it to Chips and me. It’s okay". In the end RCA's Harry Jenkins also had to weigh in to help calm things down but this time he was also on the side of Elvis and Chips. Chips Moman explains how it was for him, "Hill and Range wanted the publishing rights to ‘In the Ghetto’ and ‘Suspicious Minds’, I just blew up! I said, "Hey, there ain't no more session!" We had already done some sides, and I said, "You can take everything we've done so far, be my guest, and just get out of my studio, 'cause there ain't no more sessions!" There were just too many people, and it was aggravating on all sides. But I think they were kind of shocked when I stood up to them. They probably had never had anyone ask them to leave the studio before, but I did. And it turned out better for Elvis." Bobby Wood, "The whole thing started out on a bad note and this disagreement over publishing rights. Unbelievably it looked as if the whole thing was going to be called off. But Elvis weighed in and asked Chips personally how they could work without all these problems. Chips told him, "Get those publishing cronies and execs out of the studio, I don't want to see 'em no more" and Elvis said, "You got it!" A Million Seller - Elvis’ last Number 1 in the US. Released in the US on August 26th ‘Suspicious Minds’ would climb to Number 1 on November 1st 1969. Later on the song would be covered by countless other artists who would also take it into the charts, from The Fine Young Cannibals to Dwight Yoakam. But it is Elvis’ version that still regularly features in popular culture today, from 2001's movie 'Black Hawk Down' to the opening credits of the Coen Brother's film 'Intolerable Cruelty'. After the contemporary magnificence of 'In The Ghetto' the release of 'Suspicious Minds' really was the ultimate invincible chart statement. A Billboard number 1 that defined Elvis’ musical renaissance. Chips Moman, "To be honest I didn't really think there was anything that special about getting the chance to record Elvis, not when it happened. We were just so busy producing records in Memphis back then and a lot of 'em were hits. You see almost everybody in Memphis kind of took Elvis for granted and didn't pay much attention to how big a star he really was. Later I thought to myself, "It sure was a privilege to have worked with him. I wish I had realised that at the time we were recording, 'cause there's a lot of things that I would have liked to have said to him." Mark James, "Afterwards Elvis called and invited me to see him perform in Vegas. It was a great time for me because ‘Suspicious Minds’ was racing up the charts. When he sang ‘Suspicious Minds’ that night he said, "We've got a great writer out in the crowd tonight" and he introduced me and then he introduced Lucille Ball right behind me. His live performance of the song was fantastic. It was more than I ever could have imagined. Elvis and his band poured so much energy into it. When I wrote ‘Suspicious Minds’ I knew it was a great song and always believed it could be a number one record. When ‘Suspicious Minds’ comes on the radio today I'll still listen to it and I have a great sense of pride hearing that record. There's nobody like Elvis. He was one of a kind." Do Not reprint or republish without permission. Marty Lacker & Bobby Wood were interviewed for this article by Piers Beagley. Chips Moman comments from the book ‘Elvis Up Close’ by Rose Clayton. 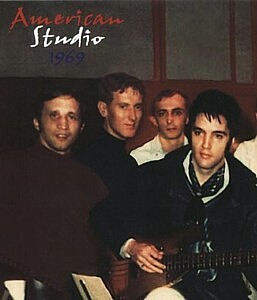 Guitarist Reggie Young - Died, age 82: While this week celebrates the 50th anniversary of Elvis' musical renaissance at the American Sound Memphis sessions, it is incredibly sad to hear that legendary Memphis Boys guitarist Reggie Young (far right) passed away Thursday January 17, 2019 aged 82. When you listen to 'Suspicious Minds', 'In The Ghetto', the classic sitar of 'You'll Think Of Me', Dusty's 'Son Of A Preacher Man' or Neil Diamond's 'Sweet Caroline' it is Reggie Young's guitar playing that leads the way. Young started his illustrious career in Memphis, where he was an in-demand session player working with acclaimed producer Chips Moman, and opened for the Beatles with the Bill Black Combo in 1964. At Moman's American Studio in Memphis, he played the signature sitar intro on 'Hooked on a Feeling' by B.J. Thomas, 'Son of a Preacher Man' by Dusty Springfield and 'Sweet Caroline' by Neil Diamond. 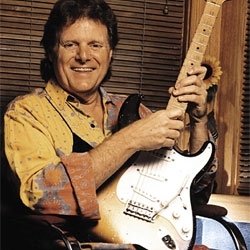 Reggie Young first played with Elvis in 1969 on the "Memphis Sessions" and again when Elvis returned to STAX in 1973. The 82-year-old Young died Thursday night at his home outside Nashville, following an illustrious seven-decade career. His passing was confirmed by family, friends and several artists he worked with, including singer B.J. Thomas. “From the first time I was in the studio with Reggie in 1967, we just fit together like a hand in a glove, and over the years became like brothers,” Thomas said. After being drafted and serving a stint in the Army, where he was stationed in Africa, and recruited by and rebuffed an offer to join the CIA, Young returned stateside where he began his stunning session guitarist career. Musicians Hall of Fame and Museum Founder Joe Chambers remembers.. After moving to Nashville Reggie’s intro to “Drift Away” alone would be enough for most musicians to hang their professional hat on for a lifetime not to mention Reggie’s drawer full of other incredible riffs or just being a member of the Highwaymen band or being on Eric Clapton’s list of favorite guitarists. Like so many other great musicians who have passed, Reggie is still with us every time we hear his guitar on the radio which is, thankfully, all the time. Reggie was among the first group of musicians inducted into The Musicians Hall of Fame and Museum as a member of The Memphis Boys in 2007. I’ve said it before, and I’m sure I’ll say it again, the most talented musicians I’ve ever met are usually also the nicest and Reggie was positively both of those.